CUSTOM CAPE ON 2.65 ACRES!! Immaculate, fully dormered Cape on desirable Champeaux Rd! Serene, private setting surrounded by woods. Brand new custom kitchen w/granite counters, upgraded stainless appliances, under cabinet and recessed lighting and hardwood floors throughout the 1st floor. Modern open floor plan, spacious family room with cozy, gas stove included. Separate dining room and den/office with custom built-ins! Master suite includes a spacious walk-in closet and master bath. 2 car attached garage with workbench, new carport and 2 storage sheds. Great commuting location, only 10 minutes from the MA Pike and Rt 84! 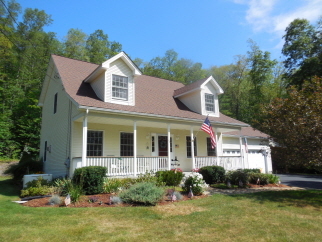 Elegant, vaulted entry with balcony welcomes your guests to this lovely 3 bedroom, 2.5 bath Cape on 2.65 acres! Vacation at home every day in the 6 person hot tub overlooking the woods! Plenty of room for all your animals and toys on 2.65 acres with a spacious, level yard. Picturesque, tree lined, paved drive is newly sealed, and has parking for 8 cars! Automatic propane generator, central air, custom stone walkway, established gardens and Boston Closet systems throughout!